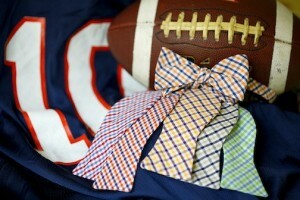 In honor of High Cotton Ties 2011 Fall line, Pretty Southern presents to you Bow Tie History 101. The next time someone asks you gentlemen “Why do you wear a bow tie?” y’all can reply with the following historical lesson. Bow Ties were originally worn by French aristocrats and called “cravats”. This fashion flourished in the 1800s around the time France was investing in the newly formed United States of America. Wealthy gents in Charleston and New Orleans quickly adopted this style to show they were just as intelligent as their French business partners. Plus they looked damn fine. High Cotton Ties has taken this style and colors fit for every collegiate occasion. North Carolina has got shades of blue for Duke, UNC and that other state school. Georgia Dawgs there are multiple bright red ties in different patterns so you won’t have to wear the same bow tie to every game (unless its a good luck charms). High Cotton ties has a bow tie for every school in the South. Check them out here and be sure to follow them on Twitter and Facebook.